Elephant is a 360˚ creative-service provider to the fine-art sector. An advertisement or sponsored content placed in our quarterly print magazine or on our online platform will deliver your message to a large global audience of creative movers-and-shakers. We also produce books and videos for partner organizations; in addition to our creative expertise clients enjoy the benefits of our excellent distribution networks—uniquely we provide both product and audience access. And now, with the opening of our first project space in West London, collaborations can take the form of a real-time, physical performance or event, made available to a global audience if appropriate via broadcast on our elephant.art online platform. 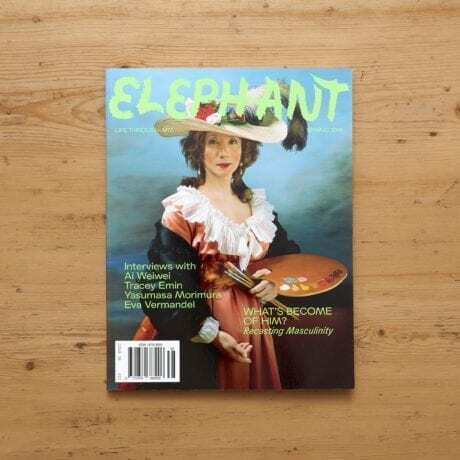 Elephant produces an ambitious list of high-quality packaged books and catalogues that are available worldwide via the global distribution network of Laurence King Publishing and Chronicle Books. It also produces video content which can be broadcast via its elephant.art online platform and associated social-media outlets. Our experienced publishing team offers a unique set of creative services including editorial, design, print and distribution, and partners with some of the world’s most innovative companies and art institutions to create premium content and products that engage influential audiences in the art and design world and beyond. We work with clients to produce books and other printed materials swiftly and to the highest standards, and can provide distribution via the networks that stretch from San Francisco and New York to Sydney, Berlin and London, as well as Amazon and other online outlets. In October, Elephant opens its first project space in West London. Elephant West will host a series of commissioned “environmental takeovers” from talented emerging artists as well as talks, screenings and events with partner organizations. Our curatorial team has assembled a dynamic programme of commissioned works and events in London’s new “Wild West”. Elephant West also provides an ideal stage for events and projects by partner organizations, ranging from pop-up stores and fashion shows to art commissions and music videos. A further, international stage is provided by elephant.art, Elephant’s website, which will be carrying live coverage and videos from events at the site.